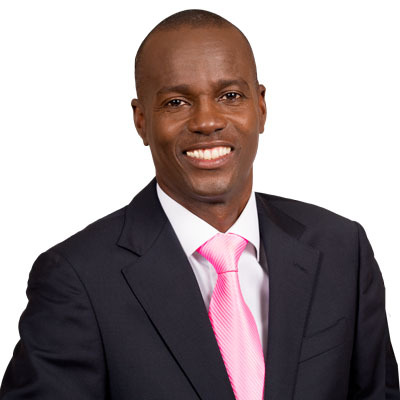 Jovenel Moïse is a Haitian politician who has been the President of Haiti since February 2017. Jovenel Moïse was born to a middle-class family in Trou-du-Nord, in Haiti's Nord-Est department. He is the son of Etienne Moïse, a merchant, and Lucia Bruno, a seamstress. In July 1974, his family moved to Port-au-Prince, where he attended the Don Durélin National School, the Lycée Toussaint Louverture, and the Cultural Center of the Collège Canado-Haïtien. He studied political science at Université Quisqueya and married Martine Marie Etienne Joseph, a classmate, in 1996. That year, he left the capital and moved to Port-de-Paix with the goal of developing rural areas. With little investment capital, Moïse created his first business in Port-de-Paix: JOMAR Auto Parts, still in operation today. He also set up a 10-hectare (25-acre) banana plantation in the Nord-Ouest department. Shortly after, he began a project to provide clean water to rural areas. In 2001, he partnered with Culligan, a company based in Port-au-Prince. With loans from financial institutions and individuals, he opened a water plant serving the Northwest and Northeast Departments. In 2004, Moïse became a member of the Chamber of Commerce and Industry of the Northwest (CCINO). Soon after, he was elected president of CCINO. He later became secretary general of the Chamber of Commerce and Industry of Haiti (CCIH), where he helped increase the representation of the regional Chambers of Commerce within the national organization. In 2008, he helped found the Haitian Energy Company SA, which aims to bring solar and wind power to 10 communes in the Northwest Department. In 2012, in Trou-du-Nord, he founded Agritrans SA and helped create Haiti's first agricultural free trade zone. This led to more than a dozen agricultural projects that created almost 3,000 direct jobs and 10,000 indirect jobs. Moïse is married to Martine Marie Étienne Joseph.